Planning a trip to Central America? Make sure you add snorkelling Caye Caulker, Belize, to your itinerary. Not only is it beautiful and fun, but a day of swimming is a great way to stay fit while you are travelling. 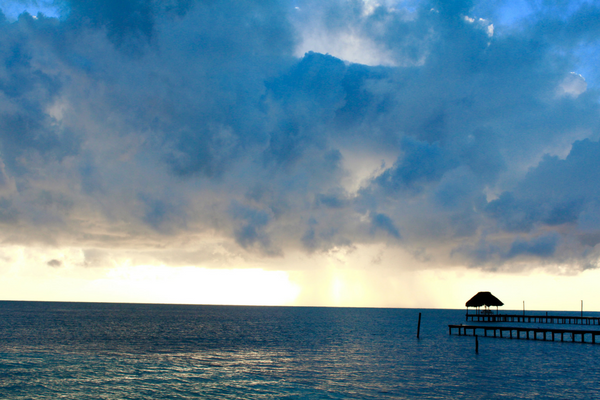 Caye Caulker is one of the most beautiful places I have ever been. Though I don’t think I realised how beautiful it was until I looked back at my pictures and noticed that I didn’t have one single bad picture. Not one. Not even when it was raining. How can a place be so constantly beautiful? I didn’t appreciate how beautiful it was at the time and hindsight is a wonderful/heartbreaking thing. 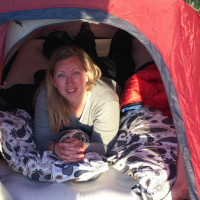 At the time I was covered in sandfly and bedbug bites, had trouble getting money from the island ATMs, a little bit home sick and damp from days of rain. Every now and then while you are travelling you have a moment where it just feels wrong, a bad day. Which is completely fine, as I have said before in another post, you have to feel it – then get over it. Despite my strange travel funk, I did have an amazing day when I went out snorkelling with Raggamuffin Tours. A highlight for me for my time on Caye Caulker and something I would recommend doing if you are heading to Central America. I am a little bit of a snorkel snob. I am Australian after all. There are many great places to snorkel around the world (especially in Australia)… and indeed in Central American, but I do think that Caye Caulker has to be up the top of anyone’s list. Overall experience – there are a number of companies that offer tours, going to different snorkel sites on different days. It is important to ask a lot of questions to find the tour that is right for you. 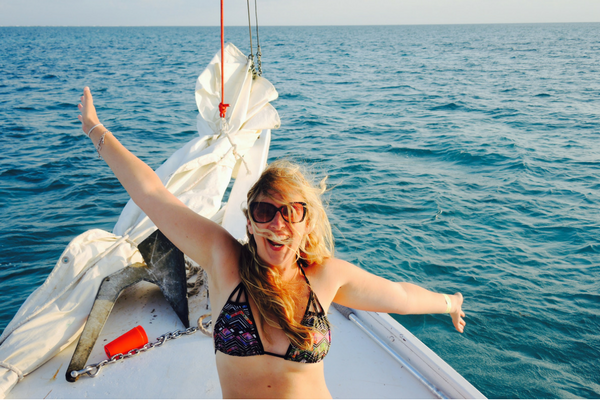 I wanted a tour that wasn’t just a speedboat ride, a snorkel and then home. I had heard that there were a few companies that used sail boats, and included a sunset sail on their way home from the snorkel sites… accompanied by some jungle punch. That was an added experience that I wanted, instead of just sitting in a speedboat for an hour to get to the site, why not sail. Price – while asking around and talking to all of the tour companies I would also do some negotiation. I narrowed it down to two companies and then ensured that I got the best price. Both companies in the end came back with a good but the same price. Service – of the two companies that I was negotiating with, one was really great and friendly, the other was dismissive and rude. I understand how annoying tourists can be, but when you make your living off of the tourism industry you do need a salesman’s face. The staff at Raggamuffin’s were helpful, friendly and had me laughing within moments of saying hello. There are loads of interesting and unique snorkel sites around Caye Caulker. Each company goes to a different place on different days to ensure that the sites aren’t too crowded. In saying that, you wont be the only tour group there. On this day we stopped at three different sites for three different experiences. Jumping over the side of the boat our snorkel guide took us quickly to a great spot to see some different coral and little fish. He would dive down and point to certain things to draw our attention to it. On the surface he would tell us the names and behavioural habits of the fish. At one point we saw a turtle off in the distance… far off in the distance. I really enjoyed being shown all of the different types of fish, including the Dory fish (a cousin to the Australian one that features in Finding Nemo) i felt like I learnt something. The next site was a bit of a swim to the edge of the reef. The aim here was to see some of the bigger fish and hopefully a turtle or two. Before we had gotten very far our snorkel guide dived down to a big rock and proceeded to wiggle around in front of it. While he was wiggling in front of the rock a giant eel popped out and snapped in our guides direction. Then slipped back into his hole. The reef was amazing, with the coral being a lot larger than our previous spot. There were a lot of bigger fish whose names I don’t know – but no sign of a turtle. 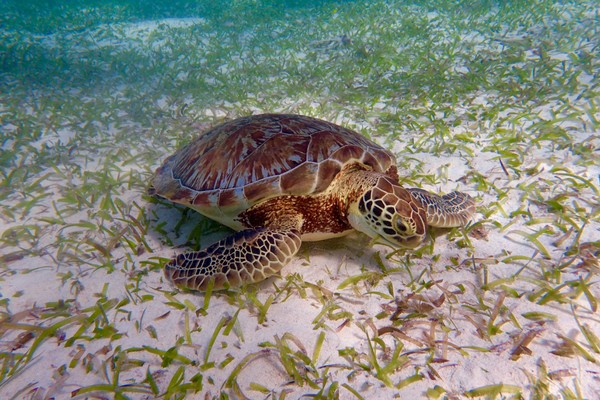 But then, on our way back to the boat we swam over a sleepy green turtle that was munching away on some sea grass. He lazily looked up at me for a moment as I dived down to grab a quick photo, before turning back to eating the sea grass. Clearly this guy had seen plenty of creatures like me before and wasn’t bothered. This was one of the most surreal and different snorkel experiences I have ever had. The boat pulled up for lunch in the sandy centre of a reef circle. After we had eaten lunch of freshly caught and steamed fish with rice and veg, the captain threw the leftover fish heads and entrails over the side. Suddenly there was a swarm of bodies underneath our boat. We were all looking over the side, gaping at the giant rays and sharks, when our snorkel guide started pushing us in the water. Swimming through and around the mass of sharks, ray’s and fish was amazing. They all dodged us easily – knowing exactly where we were. And didn’t show the slightest bit of interest in us at all – this crew weren’t hunters, but scavengers. The Service – I can’t mention how awesome the service was enough. Right from the lady who negotiated and sold me the tour, to the captain and 1st mate, to the snorkel tour guide. Everyone was friendly and helpful – making the day a lot of fun. Making new friends – this was partly due to the service, getting everyone chatting. It was also partly due to the rum punch we were served as we sailed home. Either way, I left the boat with some great friends who I continued to run into in classic backpacker style as I travelled down into Guatemala. The sailing – I absolutely loved the sunset sail on the way home. Exhausted and happy after a long day in the ocean, lounging about on the deck of a sail boat was the best way to end the day. If you are heading to Central America any time soon, definitely add snorkelling Caye Caulker to your list of things to try. If you are looking for a great tour to take you out look up Ragamuffin Tours. I am always looking for new and amazing places to go snorkelling so if you know of any, let me know in the comments below and I might just plan my next trip around them! This is not a sponsored post – all thoughts are unsolicited and my own, unless stated otherwise. Wow, swimming through a feeding frenzy! Scary as hell to me but also thrilling, I have to do it. Heart attack be damned LOL. Seeing these guys and feeling their raw power must have been amazing. Been there on the magenta travel days; old term me and my wife got from the Golden Girls TV show. We get in a funk here and there. Outside of our comfort zone. Embrace it and release it, and you are good to go. 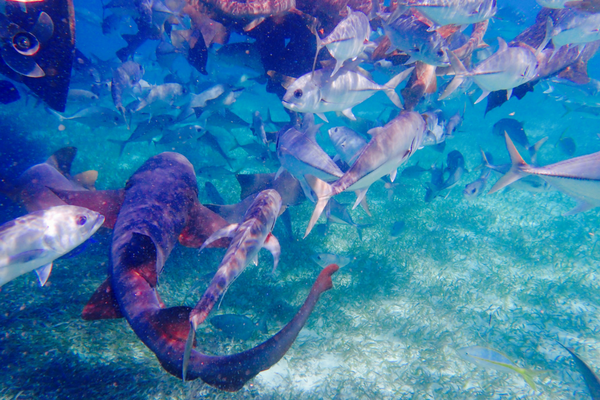 Definitely do give it a go if you head back that way – it’s not scary at all, they avoid you and are only interested in the food on the sea floor. Totally agree – get out of your comfort zone and have a new experience.